The year 2019 will witness a revolutionary change in the form factor of smartphones, led by South Korean tech titan Samsung Electronics’ launch of its first foldable display phone that could be a game-changer for the stalled global smartphone market. According to announcements by Samsung so far, the so-called “Galaxy F” is likely to feature an organic light-emitting diode screen dubbed “Infinity Flex Display” that measures 7.3 inches diagonally when it’s opened. 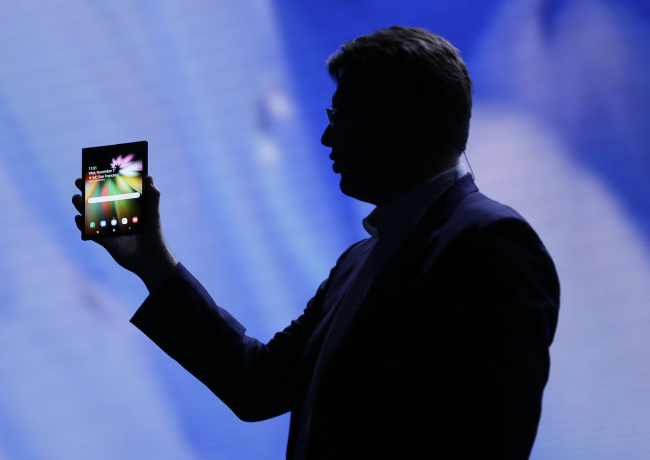 When folded in half, the size of the smartphone is reduced to 4.58 inches. The unfolded screen will split into three active areas that can run three different applications at once to facilitate multitasking. Samsung also announced One UI, a new interface design that will be used with the foldable display. Samsung plans to release 1 million foldable phones within the first half of this year, and consider churning out more, if market reaction turns out favorable. “Samsung is targeting consumers in their 40s with purchasing power, considering that the first foldable phone would come with a high price tag of between 1.5 million and 2 million won,” an industry source said. Samsung is not the only one that is currently developing the foldables. Earlier than Samsung’s announcement in November, China’s display startup Royole unexpectedly unveiled a 7.8-inch foldable Android smartphone called “FlexPai” with a starting price of $1,318. The company said it will showcase the industry’s first foldable phone at the Consumer Electronics Show 2019 opening on Tuesday. Its archrival Apple seems to be brainstorming different ways to make a foldable iPhone, according to a patent that was filed in March and publicly posted by the USTPO in late December. The patent image showed Apple seems to be considering using an OLED panel, too. The US smartphone maker is presumed to be thinking a device that folds both inwards and outwards in comparison with Samsung’s inwards-folding one, the patent showed. Chinese phone manufacturers are also joining the new race for foldables. China’s biggest smartphone vendor Huawei is rumored to unveil an 8-inch foldable display phone at the Mobile World Congress in Spain in late February, although nothing has been confirmed by the company yet. ZTE, another Chinese vendor, has filed a patent for a foldable phone, too, which looks similar to Samsung’s. Another ZTE patent application showed it is developing a double-sided smartphone with a display that wraps around the device.